Phoenicians were merchants and sailors who came from the eastern Mediterranean, from the place where today the Lebanon is located. Along with Greek settlers, a few centuries later, they were the first adventurers who crossed the Mediterranean from East to West, expanding their influence in many coastal areas of the southern Mediterranean and even the Atlantic Ocean, with special attention being given to its presence in Africa and the Iberian Peninsula. From the Iberian Peninsula, they should have been attracted by its mineral wealth, among it the so-called Iberian Pyrite Belt, to which the mining area of Huelva (Minas de Riotinto, Alosno, etc.) belongs, among other regions. This belt stretches from the Sierra de Sevilla to the Portuguese Atlantic coast. The date when the Phoenicians began their journey is not clear but, according to Velleius Paterculus (History of Rome, Book I, 2), the city of Cadiz, the Phoenician Gadir (Greek Gadeira and Roman Gades), would have been founded 80 years after the fall of Troy, which might be more or less in the year 1100 BC. However, there would be no archaeological data to confirm the Phoenician presence on the Iberian Peninsula beyond the 9th century BC. (See: Los Castillejos de Alcorrín, Manilva). In Cádiz the archaeological record of the site of the Teatro de Títeres dates back to the 8th century BC. As a comparative fact, if we listen to the written sources, the city of Carthago, in present Tunisia, would have been founded in the 9th century BC, thus, after the founding of Cádiz. Both would have been colonies of the Tyrians (of Tyre, present Lebanon). Note: Although historiographical sources are useful to know some history data, they will not always be reliable and their “integration” with archaeological records is fundamental to give some light on the past. In spite of the references to Gadir as an established town from such a remote date, according to some authors, there would have been a precolonial stage of Phoenician presence, but without stable settlements, between the 12th and 8th centuries BC, and the actual colonial period would have started in the 8th century BC or even already in 9th BC, which is when the first factories are scientifically dated. The Phoenicians had a predilection for islands (Gadir – Cadiz) or promontories by the sea (e.g. Toscanos and Torre del Mar in Vélez-Málaga, Abdera = Adra, Seks = Almuñécar or Tavira). Its stable presence further into the interior of the Peninsula is not discarded, but it is more likely to be confined to the realm of commerce. There is talk of a Libyan-Phoenician, Punic-Phoenician, or Bastulo-Punic region, which would comprise the area of greatest penetration of the Phoenician-Punic culture in the southern part of the Peninsula. It refers more or less to the Mediterranean strip (going somewhat inland) from the Strait of Gibraltar to the Cabo de Palos. However, it should not be forgotten that Phoenicians were present in other places, such as the peninsular Atlantic coast. Phoenician colonies would have their peak between the 8th and 6th centuries BC. The abandonment or decay of many of them by the 6th century BC, according to archaeological records, as a consequence perhaps of the so-called crisis of the 6th century BC, that would have produced the decline of the mythical Tartessos (which would have been hugely influenced by the Phoenician culture) when Carthaginians might have closed the Greek commercial route with this region. The conquest of the Tyrian metropolis by Nebuchadnezzar II of Babylon in that same century could have also contributed to the decline of the Phoenician factories. From that moment on, a progressive relay takes place in the control of the western area of the Mediterranean by the Phoenicians’ cousins, the Carthaginians. To the Phoenicians we owe the knowledge of writing (the Iberian script is based on the Phoenician’s) or the potter’s wheel (a great innovation). Besides, they will also have contributed to expand their knowledge in the arts of agriculture, navigation and iron metallurgy. In relation to iron metallurgy, it is frequently referred to as to have been introduced by Celtic migrations of the first millennium BC. Nevertheless, it is necessary to consider that Phoenicians would have reached the Peninsula at the end of the “peninsular” Bronze Age, and iron was already known in the Middle East for a long time before (here the Iron Age would have started aproximately in the 12th century BC ). And it would not be unreasonable to think that iron metallurgy was also introduced in the Peninsula by Phoenicians. 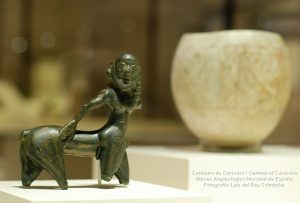 On the other hand, traces of the Phoenicians and Greeks in the Peninsula are also reflected in the so called Orientalising Art, which spread throughout the territories of the Iberians, which has resulted in a good number of examples of Iberian sculpture (the Bicha of Balazote, several sculptures of sphinxes, many thymiateria of bronze, the Astarte of Galera, the Centaur of Caravaca [see picture above], etc.). During the Bronze Age tin mines were coveted, because bronze was obtained from an alloy of copper and tin. Tin was only found in certain regions, abounding in the Atlantic coast: in Galicia (Spain), in Brittany (France) or in Cornwall (United Kingdom). Apart from a commercial land route, which would link these mines with the Mediterranean, there must have been another sea route, which would start from the Mediterranean, bordering the Atlantic coast and reach these lands rich in tin. The classical Greek authors pointed to the Cassiterides “the islands” a region (or regions, if it turns out that they really did not refer only to one, but to a generic concept of tin-producing places in the Atlantic), which could refer to any of the aforementioned . Herodotus in his 3rd book of History (Talia), paragraph 115, when referring to the confines of the western world, mentions the Cassiterides and identifies them as islands from where the tin of the Greeks would come, but he assures that he can not confirm their actual existence. Nor does Strabo, in his Geography, clarify exactly where they are located (Book III, 2, 9 and 5, 11), placing the islands north of the port of the Artabri (which would inhabit the region around present-day A Coruña in Galicia). Nevertheless, he seems to prefer to locate them near Great Britain, to judge by what he indicates in his book II; 5, 15. Phoenicians would have known and followed this trade route, at least to certain points in Galicia, where their presence would have been verified through some artifacts found, which have been identified as belonging to these people. Special attention must be given to the possible Phoenician altar of the hillfort of the Punta do Moinho do Vento (Alcabre, Vigo, Pontevedra). However, the more northern Atlantic Phoenician settlement established by some as such, would be situated a few miles upstream from the Mondego mouth and would be the Castro of Santa Olaia or Santa Eulalia (Figueira da Foz, Coimbra, Portugal). Note: Beyond Galicia, to the east and north, the presence of Phoenician materials in the Atlantic vanishes. And now, a curious, but complex study: There is a great resemblance between the Nordic runes and the Phoenician alphabet. After the Phoenicians, the Greeks also began to found colonies along the Mediterranean and their trade prospered. The classical sources (Herodotus, among others) relate the Greek contacts with the mythical and rich kingdom of Tartessos, next to the mouth of the Guadalquivir (called Tartessos by the Greeks and later Betis by the Romans). Greeks and Phoenicians would then have established fruitful commercial exchanges in the Iberian Peninsula, judging by the large number of Greek materials found alongside the Phoenician peninsular archaeological sites (for example in Villaricos, Almeria or Toscanos, Malaga). • Cabezo Lucero and Les Casetes (Alicante). • Castellones de Ceal and Toya (Jaén). • Cerro del Santuario in Baza and Tútugi (Granada). • Pozo Moro, the Llano de la Consolación and Los Villares de Hoya Gonzalo (Albacete). The Greek influence has also been noted in the Orientalising art, as already mentioned. At the moment, there are only two Greek colonies in the Peninsula which were archaeologically verified, one next to the other: Emporion (Ampurias) in L’Escala and Rhode in Rosas, both in the province of Gerona / Girona. They would have been founded by the Greek Phocaeans in the 6th century BC. Years before, Phocaean travelers would have already established the colony of Massalia (Marseille, France). On the other hand, Strabo does not rule out the possibility that Rhode was founded by the Rhodians. Akra Leuké (that could correspond with the Ibero-Roman city of Lucentum in the Albufereta of Alicante). Allon or Alonis (which would be located somewhere on the coastal strip from Villajoyosa to Calpe [Alicante], although there are authors who locate it in Santa Pola [La Picola], which Romans called Portus Ilicitanus. Hemeroskopeion (which could be Denia). To the south of the Segura the settlement of Mainake or Menace, another Greek foundation according to Strabo (Geography, III, 4, 2), could have been located (somewhere near Malaga, perhaps nearby the Cerro de los Villares, where a Phoenician settlement was established before). Archaeology has not been able to verify Greek settlements on these places – hence, they are sometimes called ghost Greek towns- but the Greek influence was still present by way of the trade of Greek articles and the traces of the Greek alphabet in the Greek variant of the Iberian Script (look up: Leads of Alcoy, Alicante). Phoenicians and Greeks got necessarily in touch, sometimes friendly, sometimes in a hostile attitude. Pressure exerted by Babylonians against Greek and Phoenician polis in the East, during the 6th century BC would have had several consequences. On the one hand, the focus of Phoenician power would have moved from ancient Phoenicia to Carthago in northern Africa and, on the other hand, Greek settlers – who would have increased in number as a result of their exodus – and the “western” Phoenicians, known as Carthaginians, allied with the Etruscans would have fought in the battle of Alalia (Corsica) in 537 BC. Although the Greeks would have won this battle, their losses would have been so great that that event would have marked a before and an after in their colonial expansion. The new Carthaginian power (also called Punic) certified its hegemony in the western Mediterranean, falling the Phoenician factories in the coast of the Iberian Peninsula, among other Mediterranean settlements, under its direct influence. The Greek presence in the Peninsula, which would not disappear, would be limited to the north-east coast (Gulf of Roses, with Emporion and Rhode). It is likely that there was a division of influences between Greeks and Punics, establishing a probable border near the mouth of the Segura River (where the town of Guardamar del Segura, Alicante is currently located). Precisely in Guardamar del Segura the most northern Phoenician remains of the peninsular Mediterranean have been found to date. Punics might have remained south and Greeks to the north. The main Greek and Phoenician archaeological sites (and museums with Greek and Phoenician artifacts) that we can find in the Iberian Peninsula are listed in the previous post (there is a map, too). Note that you will not find information on Punic or Carthaginian settlements that were created ex novo or starting from previous outposts from the 6th century BC onwards, after the fall of Tyre. In this regard, special mention should be made to: Cartagena, the Qart Hadast of the Punic period, the city of Lucentum (possibly the ancient Akra Leuké), Carteia in the Bay of Algeciras (a Phoenician founding at the neighboring Cerro del Prado) or to the necropolis of the Puig des Molins in Ibiza.